COLOMBO: Sri Lanka marked the sixth tsunami anniversary that claimed the lives of more than 40,000 people with a host of religious events Sunday. A two-minute silence was observed throughout the country at 9.25 a.m. (0355 GMT), the time the killer waves first hit the eastern coast. Most coastal areas in the island nation were hit by the tsunami that displaced more than one million people and destroyed over 100,000 houses. The government held a national safety day in the northern city of Jaffna to coincide with the anniversary, while in the southern and eastern coastal areas religious events were held. 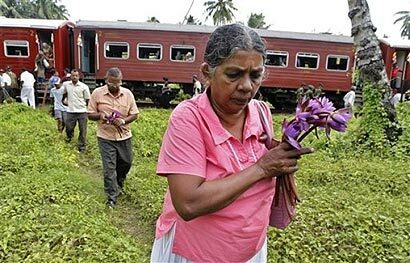 A train made a symbolic trip to the location where it was hit by the tsunami along the southern coastal line. About 1,700 passengers died Dec 26, 2004. Only the engine and two of its original 12 compartments have been restored. The government has also established 50 tsunami early-warning centres nationwide. Lets pray not to happen another Tsunami in our country.